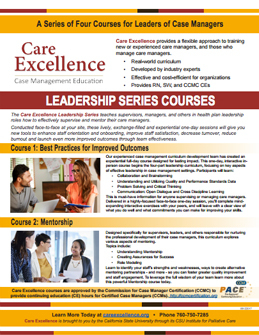 Best Practices for Improved Outcomes is the first course of the four-part leadership curriculum for case managers, care managers, and case manager supervisors. The course takes participants through essential first steps in creating a high-performance team and work environment. This opening module provides you with specific methods for creating a supportive, collaborative environment, and underpins that, with what the benefits of collaboration are. Next you will learn and practice a variety of brainstorming techniques, and through conclusion exercises, review the techniques to employ in your case management team to achieve the benefits of brainstorming. Critical to group success is the identification and sharing of resources that each team member has accrued. Whether the resource describes available home health services, mobile professionals, nutrition, meals, or other services that may assist a struggling member, it is imperative for mentors, case manager supervisors, and managers to facilitate sharing among care management team members of any resources they have that can assist each other. This portion of the day will cover this topic, and how to create lists and other methods for building and maintain robust resource databases, whether physical or electronic. Understanding and utilizing quality and performance standards data is critical knowledge for every member of the care management team. In this portion of the day you will learn quality performance standards and the outcomes related to quality standards prevalent in today’s healthcare marketplace. A thorough review of how to assess member functional status including not only activities of daily living (ADLs), but their ability to manage their home and meals, and their capacity to make personal decisions, is covered in this section of the day. Has your case management experience taught you that problem solving requires a structured, planned process? Or that creative thinking is the domain of only artists and inventors? In this section of the day, you will dispel the myths that may be present in your practice or organization, and learn techniques that will assist you to creatively solve problems either on your own or within your team. In class exercises, you will apply techniques to improve creative problem solving, learn the stages of self-disciplined reasoning, experience different types of questions in the critical thought process, and apply reflective thought and critical thinking concepts that you can take home and use in your team. While communication is assumed to be a basic skill that everyone possesses, it is still ranked among the most critical management competencies that employees seek in their work environment. This module focuses on techniques, and includes practice, in ensuring open dialogues and cross-discipline learning, both important elements for promoting best practices of care management and for improving outcomes in your organization. Participants will begin this module with a comprehensive discussion of what is important to improved communication with care managers. 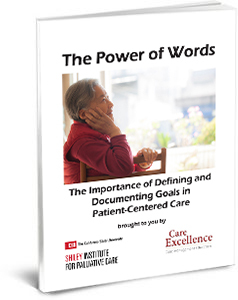 You will discuss goals of good communication, experience techniques for communicating with peers and other professional partners, and learn how to get new care managers engaged in discussions with seasoned care managers in order to promote cross discipline learning. This module will help you improve communication within your case management team, encourage open dialogue, and build interactions that will promote learning. The day-long Best Practices for Improved Outcomes will deliver not only invaluable learning and tools, but will accelerate teamwork and application of the content as the attendees return to their work environments. This is the first of a four-part series. Learn more about the other courses including Mentorship, Leadership and Innovation. Best Practices for Improved Outcomes has been pre-approved by the Commission for Case Manager Certification (CCMC) to provide 8 hours continuing education credit to Certified Case Managers (CCMs).